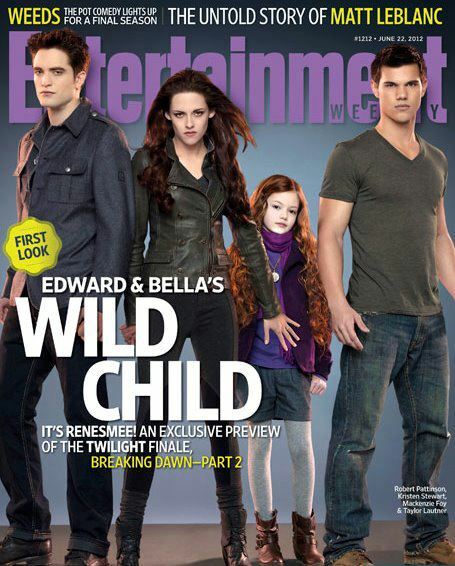 Edward and Bella's Wild Child Features in Entertainment Weekly Mag! "Breaking Dawn Park 2," the finale of the hit "Twilight Saga" movie is one of the most awaited film this year. Different promos for the said movie were already launched since the film is set to premiere this coming November! Aside from the characters of Edward, Bella, and Jacob, the new character who excites the viewers is Renesmee, the daughter of Bella and Edward. Joining the little girl in the said cover are the three stars namely Robert Pattinson (Edward Cullen), Kristen Stewart (Bella Swan), and Taylor Lautner (Jacob Black). This is such another great cover from Entertainment Weekly mag! Cool!